Traffic islands help pedestrians to cross the road by splitting it into two parts. They are also sometimes used to help slow traffic down by making the gap they have to drive through quite small. 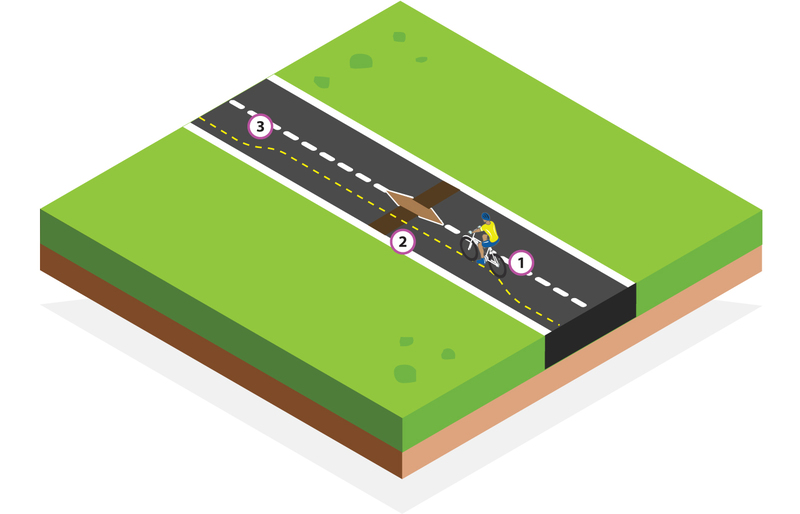 The main danger for you as a cyclist as you ride up to a traffic island with a small gap, is if traffic tries to overtake you at the island. To keep yourself safe, follow this plan. Well before the traffic island, check back and when safe move into the primary position so as to block your lane. As you approach the traffic island, have your brake levers covered as pedestrians may step off the pavement without looking. They may also not hear your approach, remember many pedestrians wear head phones to listen to music and are very unaware of what is happening around them. Once you have ridden through the island and you feel it is safe, check back over both shoulders and if safe move back to the secondary riding position. When approaching traffic lights, think about whether you may need to change the gear you are in should the lights change unexpectedly. Make sure you have your brake levers covered with your fingers in case a pedestrian unexpectedly walks out in front of you and you have to brake quickly. There may be more than one lane for you to move into at crossroads and roundabouts. There are normally white arrows painted on the road to help you know which lane to choose. Well before you get to the traffic lights, check back and when safe to do so, move into the primary riding position to block the lane and stop traffic getting past you. (If there are lanes to choose from, make your decision and move into the lane, taking up a primary position in that lane). Maintain the position until you are through the junction. When you think it is safe, check back over both shoulders and when safe move back to the secondary position. Well before you get to the traffic lights, check back and when safe move into the primary riding position to block the lane and stop traffic getting passed you. (If there are lanes to choose from, make your decision and move into the lane, taking up a primary position in that lane). Give a clear left signal should you need to do so, make sure your hand is back on the handlebar for your turn. Turn left, stay in the primary position until it is safe to go back to the secondary riding position. 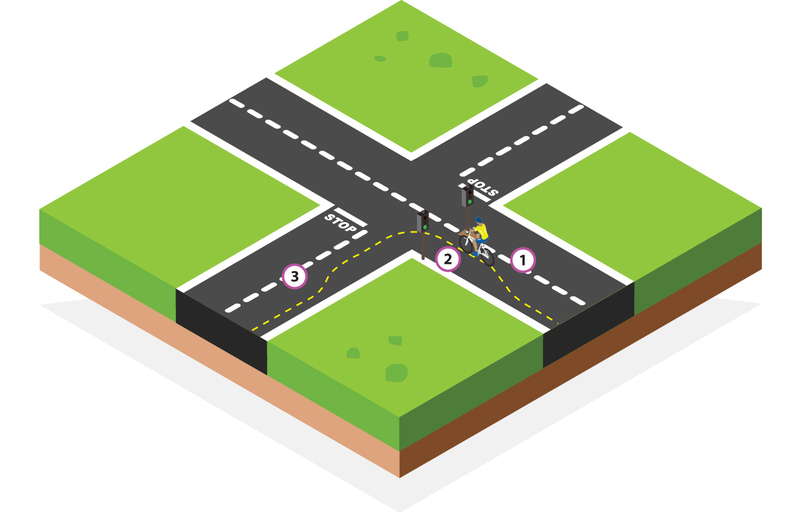 Well before you get to the traffic lights, check back and when safe to do so, move to the primary riding position to block the lane and stop traffic getting passed you. 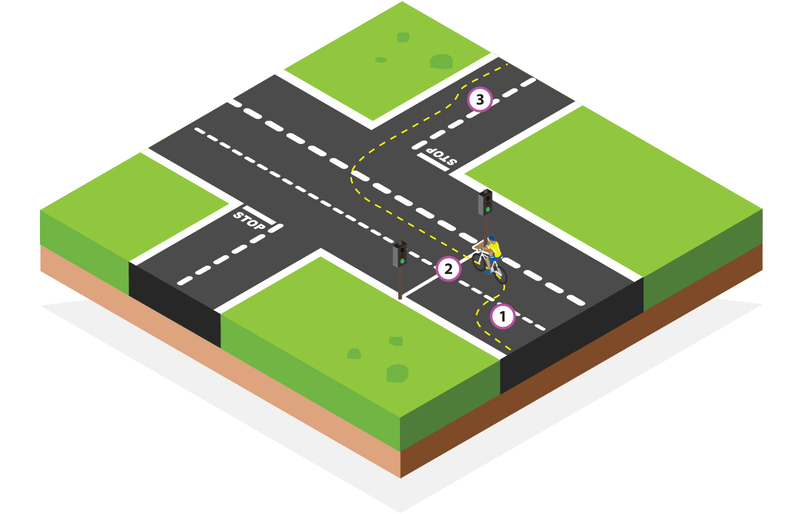 Choose the right lane, if you are approaching a two lane junction, check back and signal if necessary to move into the right lane, take up the primary riding position. If the traffic light is green, and the road ahead of you is clear of traffic, make your turn without cutting the corner taking up the primary riding position until it is safe to move back to the secondary riding position. When the green arrow is on, you can ‘carefully’ make the right turn. Traffic in the opposite road ‘should’ stop as their traffic light will be red. Always remember, people do make mistakes and may not see the red traffic light (or you), so be careful. If the green arrow is not on, but the main green light is on, wait at the stop line until the green arrow comes on.